51 Inlet Cove. Beach. Biking. Nature. Trails. Tennis. Golf. Resort. Kiawah Island. Charleston. Sweetgrass Properties. Sweetgrass. Vacation. Summer. Pool. River. When driving up to the cottage, you can't help but notice the beautiful views that you won't be able to take your eyes off of the whole trip! You have ample parking in the car port and driveway. Once you make your way up to the main floor, you will notice the open concept living and dining area. With comfortable furnishings in the living room and flat screen TV, you are sure to relax. This area is open to the dining table, seating 6, and flows in to the kitchen that also has a table for extra eating space. There are 3 bedrooms and 2 baths in this cottage. The Master bedroom will be off the living room and connected to the back porch. This room has a king size bed, private bathroom and flat screen TV. The second guestroom will have two twin beds and shares a bathroom with the third guest room, which has a queen size bed. 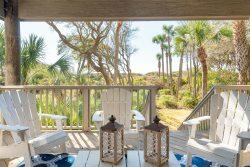 Relax on the lovely screened porch with amazing water views. For your convenience, this cottage does come with a washer and dryer as well as WiFi. Need more space? We also manage the house next door, 50 Inlet Cove! Instructions, communication on accessing the property were great! Made it really easy to come and go! Great neighborhood, very quiet and great for kids. Access to Kiawah was extremely convenient. Recommend renting bikes! We weren't there for weather to enjoy the pool, but everything about the neighborhood and property were great. We were pleasantly surprised to find a brand new grill on the back deck. Very pleasurable experience!